Investigators went inside of Chinese fur farms to ascertain the condition of animals on these farms, as China is the largest exporter of fur. This is the first report of its kind; the original report was conducted in 2004-2005 with updates made to the report in 2007. The investigation revealed that animals were kept in inhumane conditions and many were skinned while still alive; some animals remained conscious five to ten minutes after their skin had been removed. "This is the first ever report from inside China’s fur farms. Investigators of the organisations Swiss Animal Protection SAP and East International visited several farms in Hebei Province as part of this field research. Numbers of animals held at these facilities ranged from 50 to 6000. The report is based on field and desk research carried out in 2004 and January 2005. It provides background information on the Chinese fur industry and describes and documents husbandry and slaughter practices. The report goes on to place China’s role as the world’s largest exporter of fur garments into a global context, which involves direct links to Europe and the United States. It ends in a set of urgent recommendations for policy makers, retailers, fashion designers and consumers." "Eighty five percent of the world’s fur originates from farms. China, also a member of the Iinternational Fur Trade Federation (IFTF), is the world’s largest exporter of fur clothing and according to industry sources, the biggest fur trade production and processing base in the world. Between 25% and 30% of the country’s fur is obtained from wild animals, while 70-75% originate from captive animals. China is also one of the few countries in the world without any legal provisions for animal welfare." "To date, Chinese fur farmers hold four million foxes and an estimated four million raccoon dogs. The Sandy Parker Report estimates Chinese mink production to be in the neighbourhood of ten million and growing rapidly (issue 16 October, 2006). China is now the world’s leading producer of fox and racoon dog pelts and the second largest producer of mink pelts. As of 2007 there are10 universities in China offering courses in fur farming and two have them as majors. There four fur research institutes have been established." "The international fur sector is complex, with pelts produced by farmers passing through several countries and undergoing various processes before it reaches the final consumer. Chinese Customs statistics indicate a net volume of fur imports of US$ 330 million (China Daily 04-08-2005) and exports of nearly US$ 2 billion for 2004. Zhang Shuhua, deputy chairman of the China Leather Industry Association told reporters that the fur imports were up 54 % and exports 123 % (!) within one year from 2003. More than 95% of fur clothing produced in China is sold to overseas markets, with 80% of fur exports from Hong Kong destined for Europe, the USA and Japan. According to the Sandy Parker Report (3/21/05) China exported a staggering US$ 1.2 million in fur trimmings to the United States just in the month of January 05. The country’s expanding product range includes pelts, full coats, fur accessories, such as scarves and hats etc., toys, garment trimmings and even furniture. A random market survey in boutiques and department stores in Switzerland and London discovered fur garments labelled “Made in China” among top fashion brands." 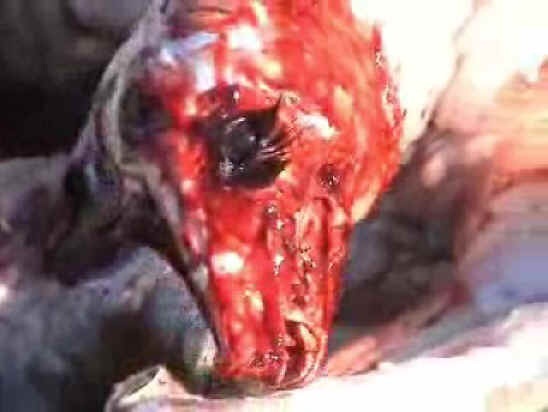 "Between November and March, foxes and racoon dogs are sold, slaughtered, skinned and their fur is processed. Animals are often slaughtered adjacent to wholesale markets, where farmers bring their animals for trade and large companies come to buy stocks. To get there, animals are often transported over large distances and under horrendous conditions before being slaughtered. They are stunned with repeated blows to the head or swung against the ground. Skinning begins with a knife at the rear of the belly whilst the animal is hung up-side-down by itshind legs from a hook. A significant number of animals remain fully conscious during this process. Supremely helpless, they struggle and try to fight back to the very end. Even after their skin has been stripped off breathing, heart beat, directional body and eyelid movements were evident for 5 to 10 minutes." "This report shows that China’s colossal fur industry routinely subjects animals to housing, husbandry, transport and slaughter practices that are unacceptable from a veterinary, animal welfare and moral point of view. Housing, husbandry, transport and slaughter conditions fall drastically short of both Swiss and EU legislation."